The BBC is to conduct a major survey to chart the availability of 3G and 2G services across the UK over the next month. 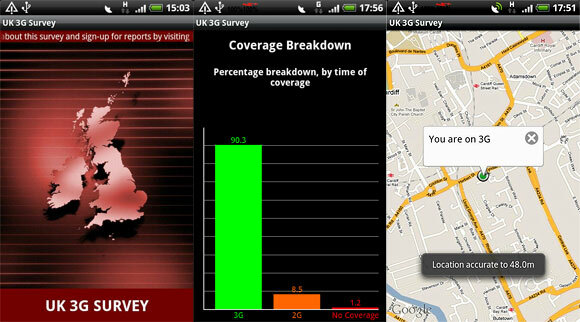 With no independent survey offering consumers about nationwide coverage, the BBC has teamed up with network analysis firm Epitiro to create an Android app to record street level coverage across Britain. Industry regulator Ofcom recognises that coverage is a priority, and estimates that in terms of land mass, 91% of the UK has 2G coverage and 76% has 3G coverage. More information on coverage is required, and this should be in a standardised format enabling comparison between operator services such that users can make an informed decision about coverage in their area. Whilst postcode-based checkers go some way to this, their accuracy is limited to the point at which they have limited value. Very good initiative. I’ve downloaded it.